The Anhinga or American darter (Anhinga anhinga Linnaeus, 1766), belongs to the order of the Suliformes and to the family of the Anhingidae. It is one of the four members of this family and represents the species typica to the American continent. Rightly for its position in the New World, the scientific name given and then taken again in the various vulgar names, is originated by a term used still now in the Tupi Guarani language of the Brazilian forest where this bird is widely present. 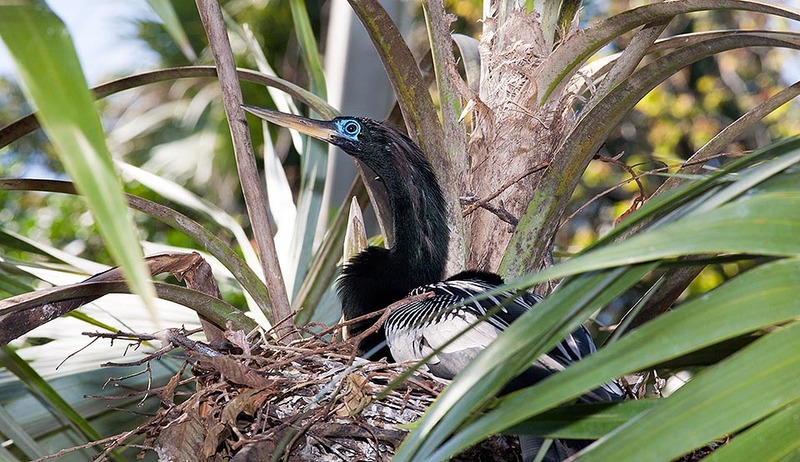 In the Anglo-Saxon world the anhingas are vulgarly called Darter, from dart or somebody or something moving frantically and quickly, to rightly indicate one of the characteristics typical of this aquatic bird: the surprising speed it develops when it is under the water hunting fishes often overtaking them. It is a real loose cannon that flickers with amazing rapidity during the straight pursuits as well as in the sudden veerings, the impetuous soarings, avoiding any possible obstacle with exceptional cleverness. It does better than the same fishes it is chasing. The whole is due mainly to the particular lack of buoyancy caused by the desired soaking of the feathers that allows to remain submerged without any difficulty and without the upwards thrust that the oiled bodies of the aquatic birds have as a protection of their liver. This benefit is then paid for with the necessity to often come back in the surface for drying up the plumage, operations without which it would be practically unable to fly. The wings are kept in a particular hugging position, with a circular shape to seem, as local Americans say, a turkey clucking towards a female. As a matter of fact, they have given it the nickname of water turkey. The presence of this bird, however very common, is easy to note by observing the floating dry trunks where it invariably settles with the wings wide open, after the countless daily fishing trips. It is also commonly called snakebird because when floating it leaves out of the water only head and neck, actually very thin and long, making it look really like a big semi submerged reptilian. It is a typically aquatic bird, habitat to which is closely related for its survival. Despite being an excellent flyer, it prefers to live and to escape in water rather than taking off at the approach of an impending danger though being equipped with an alar apparatus capable to allow it good flights and a times very high twirls. Much like the cormorants with whom coexists peacefully, it does not show social or food fights frictions with them, often diving together without any difficulty, sharing the same hunting territories. 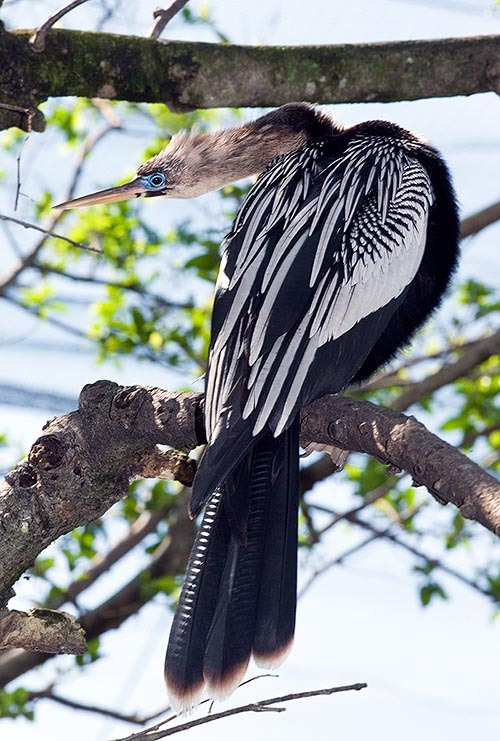 The most frequent common names are, in English, American darter; in French, Anhinga d’Amérique; in Spanish Anhinga americana; in German Amerikanischer Schlangenhalsvogel; in Italian Aninga americana and in Portuguese Biguatinga, Carará. Of the four species present in all continents, Europe excluded, this anhinga occupies only the American tropical world. Conversely, its congeners are represented in Africa by the Anhinga rufa, in Asia by the Anhinga melanogaster and in Australia by the Anhinga novaehollandiae. The American anhinga occupies the entire Caribbean coast and the hinterland of the nations facing it, including the islands and going southwards, all the South American continent up to the extreme north of Argentina. The northern populations have their biggest colonies in the Everglades in Florida and in Cuba and Jamaica. West, it occupies the Pacific southern coast of Mexico up to Colombia excluding of course all the Andean part. A fairly vast territory and that sees it well diffused and very numerous. It is a resident species and is not subject to particular migrations apart short and occasional movements between the various marshes according to the trend of their water level. It has been noted, however, that in the extreme points of the northern ranges, some populations tend to undertake journeys towards more southerly and warmer areas in particular when the weather conditions of the original sites are hit by sensitive drops of the temperature. There is no water stream or body of water that doesn’t see the presence of this bird. Strictly linked to the aquatic environment, it could not anyway survive in other locations and still less think that with its morphological structure it may adapt to different habitats. A machine designed solely for staying in the water like the cormorants, the penguins, the divers and other similar beings that shows a huge difficulty and equal clumsiness at the only need to take a few steps on the ground. Its ideal places are the still, little current waters, water basins even artificial, marshes and swamps and rarely, forests of mangroves at the limits of the tide. It is not a sea bird but does not disdain, when available and practicable, a flicker among the tangled submerged roots of these trees. The presence of this bird is surely an index of purity and clarity of the waters present, as the transparency is essential for getting the food besides of course for a good availability of fish. As mentioned before, the anhinga loves to perch on dried trunks surfacing from the waters with the wings completely lied in the sun to dry up, operation it does quite often but obligatorily after each immersion not only to dry up the soaked feathers but also to thermoregulate the body temperature, otherwise it would be subject to sudden hypothermia. Almost like the lizards, operation confirming how much the birds are close to the reptilians. All anhingas present in the various continents have almost the same size, the same aerodynamic shape, the same weight and the same habits. The American anhinga is about 90 cm long, has a wingspan of 150 cm and a weight of about 1,5 kg. Only difference with its congeners stands in the colours of the livery that in this case is completely black with white streaks on the wings for the male and a more brown plumage for the female and the young. 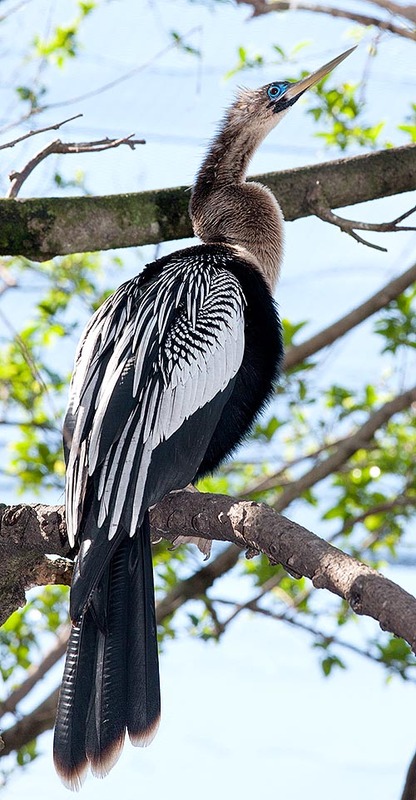 Some specimens show transition liveries that see an increase of the brown colour on the neck and on the chest so much to make them look like the African species (Anhinga rufa). However, the risk of confusion is absolutely unlikely seen that the ranges of the two species are separated by the Atlantic Ocean. 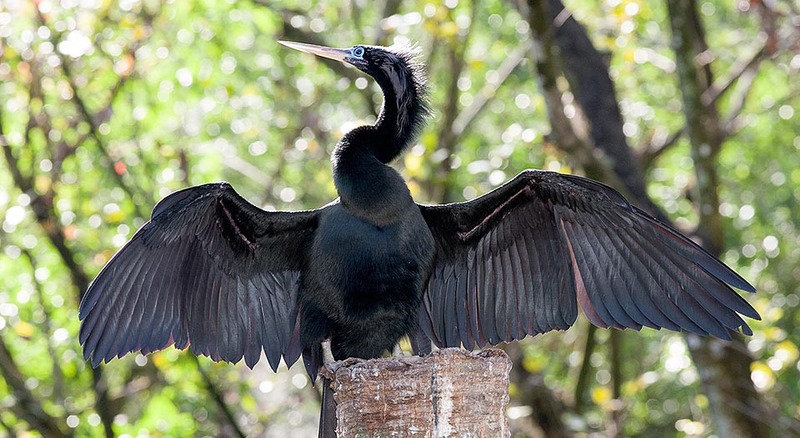 The American anhinga has a long black tail, that in a subspecies shows a yellowish terminal edging, a magnificent tool it uses as rudder during the underwater fishing hunts. The beak is yellow, long and pointed, that it often uses as spear for catching the bigger preys. A real spear that pierces mortally the victim that then is gulped down in surface with an aerial mastery of a juggler. 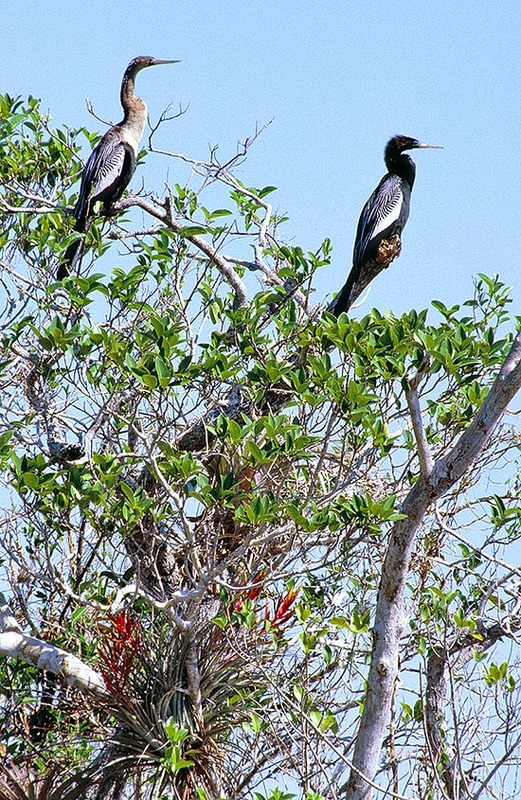 The anhingas do not have nostrils on the beak through which to breathe but do this directly with the mouth. The feet are completely webbed and are of remarkable dimensions and such to allow a thrust and an incredible manoeuvrability during the immersions. The aerodynamicity is then facilitated by the sharp silhouette of its body that sees every single part of it incredibly suitable and suited to the activity it is called to perform. The anhinga nourishes mainly of fish that pursues with extreme agility under the water at times overcoming it in skill. It eats also crustaceans, water snakes and amphibians. It always nidifies close to the water streams, mainly on the overlooking trees or also on branches hanging directly from them. This happens usually in very crowded colonies and mixed with other species but occasionally also isolated, with nests built with a disorderly base of more or less robust twigs, standing on the low branches of a tree or at times also on brushes or flat bog grasses but always close to trees where the colony insists. It lays up to 5 eggs that are hatched by both sexes for about 30 days. The chicks are born featherless, remain in the nest for 5 weeks more before the fledging and are followed by both parents. They are birds that willingly leave the nest before fledging, toddling on the near branches and often invariably falling in water with the imaginable results. The caimans and the alligators know well this opportunity and tirelessly and patiently wait for this sudden manna falling from the sky. The Anhinga anhinga is a species not subject to any regulation being well diffused and present in good number.